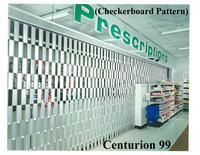 The Centurion checkerboard design provides a good combination of security and visibility. 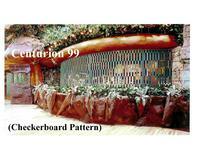 Its sturdy pattern is made of extruded aluminum vertical panels hinged to steel rods for extra strength. The exclusive scissor-link folding mechanism gives an open appearance from top to bottom. Available in 6", 9", 12" and 15" pattern.